Walsine Pierce: DEATH AND TAXES: Two Certainies Of Life! My daughter-in-law, Mary Kay, shared this picture of her mother, Marilyn, who passed away last year. My personal physician faithfully reminds me that, while I live an exuberant life at nearly 81 years of life, that inside "the plumbing is old and worn". So it was with Marilyn, a friend of over 30 years, her pump (heart) failed after a relative short illness. The person pictured on the left, taken on a beach vacation our families shared, was the fun loving Marilyn that I knew. A high school cheerleader once, she loved to dance, play cards, fish and was a died-in-the wool Democrat. She remained the family champion in ping-pong. She enjoyed life but died peacefully with her family present. Thats about as good as it gets, in my opinion. DEATH AND TAXES ARE SUPPOSEDLY FOR CERTAIN. Death still is but, for about half of Americans today, taxes are not. Average life for Americans born in 1931 is 57.7 years for males and 60.9 for females. While the life expectancy at birth was 59.12, at age 80 it becomes 85.6. The older one gets, the longer their life expectancy becomes. For people of faith, death does not need be an experience to be feared. In deed, in the case of my Mother, who was going blind and about to lose her independent life style, death was highly desired. Not at all ill, she prayed to die and did so quite peacefully saying "Yes Lord". Sadly, I have seen death come to those without faith and the experience was entirely different. Discussing this with my brother, Henry, I said I thought when the time to die came, we would be ready for it. He was and I'm sure I shall be. This is a picture of me in 1949 aboard ship at Pearl Harbor at age 18. It amazes me how quickly life seems to have passed. This super bowl weekend was enjoyed with family, including exuberant great grandchildren. How full of life! Yet, in 1915 my mother was a teenager and full of life, as seen in the above picture. While she lived during the worst of times, she could be depended upon to make life better for all with whom she came into contact. 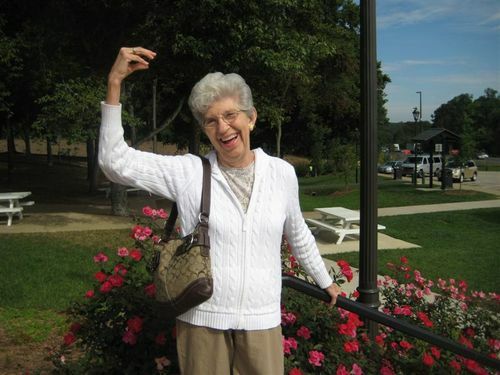 She loved to dance, ice skate, swim, fish, play cards and cook. Most of all, she loved to be with family.I am my mother's son, except for ice skating. If I have observed one thing in life it is that my enjoying a contented life is something that seems to be denied to the rich and famous. If life is what we make it, and I believe it is, why not make it a great life? I do! You can! And, you can start at any point in your life to do so. Try it, you'll like it.